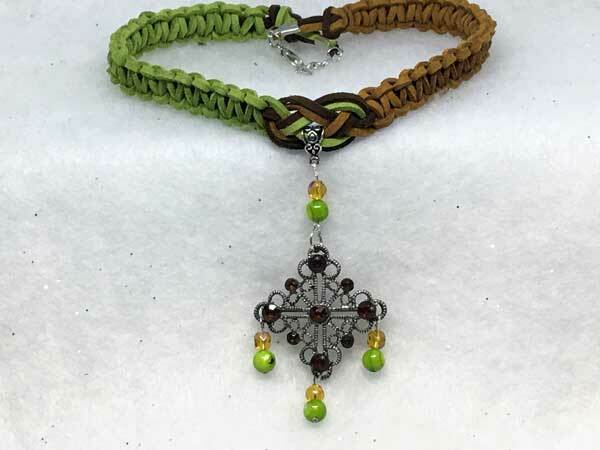 This piece is made with the beautiful richness of suede cord in golden-brown, dark brown and kiwi. The length can vary from about 16 to 19 1/2 inches with a center jeweled piece that adds 3.5 inches. The first section of the jeweled piece is a fully-faceted golden glass round, sitting atop a glass round in varying shades of kiwi. Hanging separately from this, for added movement and sparkle, is a piece that started as a pin, and still has the pin attachment. It is a filigree metal square that is adorned with dark brown glass accents. I have added to this, beads that mimic the top section of the jeweled piece.